Taco Holder at Richard Sandoval’s El Centro D.F., Facebook. However ingenious it might be, the flat-bottom taco shell is not Mexican style. Instead, these prefabricated crunchy tacos exist somewhere between contempt and respect for their place in history. They were developed from the first tacos in the United States (not Mexico), but are considered tasteless bastardizations of their progenitors. Still, they allow for safe entry into the wider world of tacos and carry nostalgia with those who grew up eating them on taco night or Taco Bell. They’re also extremely fragile. Appearing in the United States in the early 20th century, these hard-shell vittles were created by Mexican immigrants, embraced by Anglo Americans and reviled by Mexicans as aberrations of their traditional tacos dorados (fresh fried tacos). 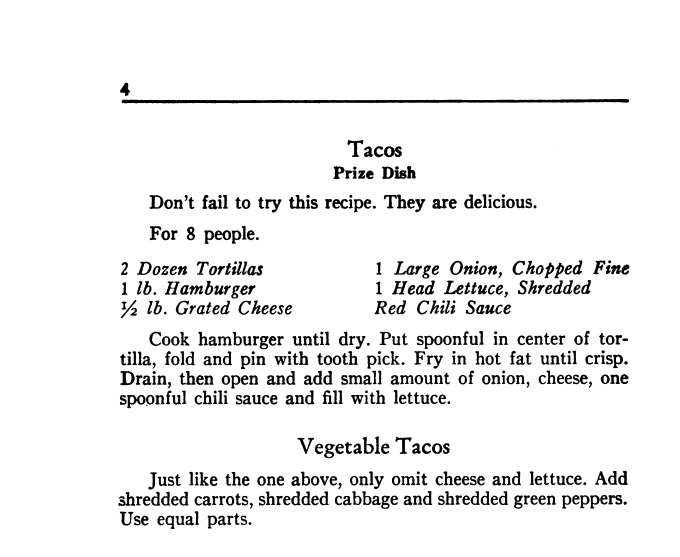 Recipes published in newspapers and cookbooks touted the taco as acceptable and safe for Anglo-American consumption, among them Myrtle Richardson’s 1934 Genuine Mexican and Spanish Cookery for American Homes. Frying, baking or heating hard taco shells in the home kitchen took off in the United States. Taco recipes from “Genuine Mexican and Spanish cookery recipes for American homes,” 1934. There was the issue of bodily harm caused by frying the corn tortillas by hand. To solve that dilemma and perhaps to save his restaurant, Xochitl, in New York City, Juvencio Maldonado conceived the first device for frying multiple corn tortillas into the familiar U shape. He filed a U.S. Patent and Trademark Office patent application in 1947 and was awarded it in 1950. Myriad, similar devices followed, including Santiago M. Luna’s “utensil for cooking tacos” and Victor Torres’ “Frying utensil,” both in 1953. In his application, Torres outlined the concerns in the production of taco shells. The preparation of tacos involves frying oi [sic] tortillas while held in a folded or U-shaped formation and when the tortillas are fried crisp they are removed from the oil or liquid in which they are fried and are supplied with a suitable filling. The frying operation just referred to is deep frying and with methods heretofore employed this operation has been somewhat difficult and tedious as it requires manual holding of the tortilla in the desired shape while frying, or the use of rather makeshift pans to hold the tortilla in proper shape. the fragile nature of the tortilla when fried crisp, and because of this, ordinary methods of preparation have resulted in much breakage. A general object of this invention is to provide a frying utensil that can be easily and conveniently used to handle one or more tortillas in a bath of oil or fat so that the tortillas are properly fried without constant holding or attention on the part of the cook and without danger of loss or breakage such as ordinarily attends the frying of tortillas. But there was still trouble in taco town: How to prevent the shell from falling over and consequently cracking—not to mention increase its appeal to Americans? A solution came with the creation of the tabletop taco holder. The earliest patent application for such an accessory was filed by James R. Loven of San Fernando, Calif., in 1969, and granted the following year. Loven’s invention, an “ornamental design for a taco holder,” resembles a winged butter dish with a description that was the real selling point. The taco holder has been from the beginning about aesthetics. Presaging the modern multi-slot taco holder, Lois L. Guerrero of Hilo, Hawaii, filed her patent application in 1977. She went into more detail than Loven’s record. 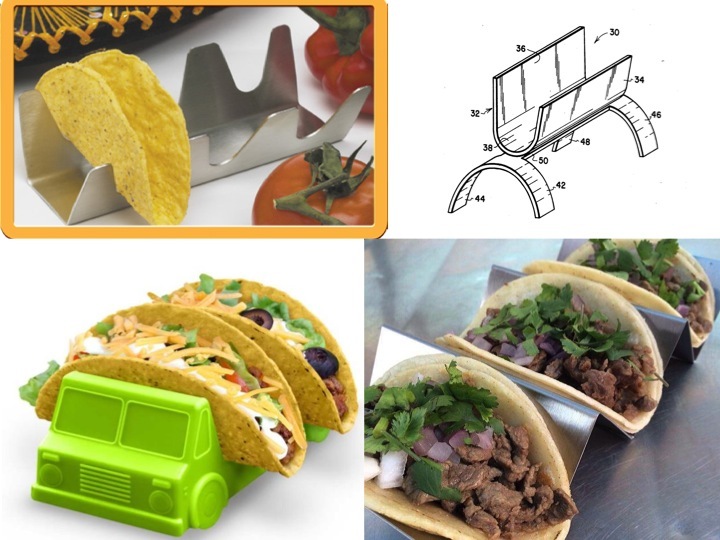 A taco holding tray to support “V”-shaped taco shells for filling and serving, comprising a tray having a linear trough for supporting taco shells, the length of which trough is at least as along as the length of the taco shell, said linear trough having a rounded bottom to support the normal bending radius of the formed taco shell and outwardly inclined side walls forming an open “V” of about 30.degree. to 45.degree., the depth of which trough is such that the side walls will support all but enough of the sides of the taco shell for removal of the taco shell from the trough by the fingers, and an overflow catching means at each end of the trough to catch and hold excess filling material from said taco shells. In a clever turn, O. Ray Conder Jr.’s TACOSIT, resembles a sombrero, although it hews more closely to the favorite headpiece of Curious George’s Man in the Yellow Hat—or newly hatched chicks ravenous for tortilla product. Conder Enterprises, sombrero taco holder, the TACOSIT. Just as odd is the list of references cited by the patent applicants: An epiphanic hodgepodge of objects: napkin holders, frying implements, an ice cream cone stand, an ashtray. Guerrero’s USPTO application includes “Clam-Bakers,” patented January 22, 1878. Peculiar references and patent applications for the receptacles continued—and continue—to inundate the USPTO, with a narrow (and incorrect) concept of the taco evident through use of standard language like “[a] taco is a sandwich made of a tortilla rolled up with or folded over a filling and then usually fried” common in the applications. 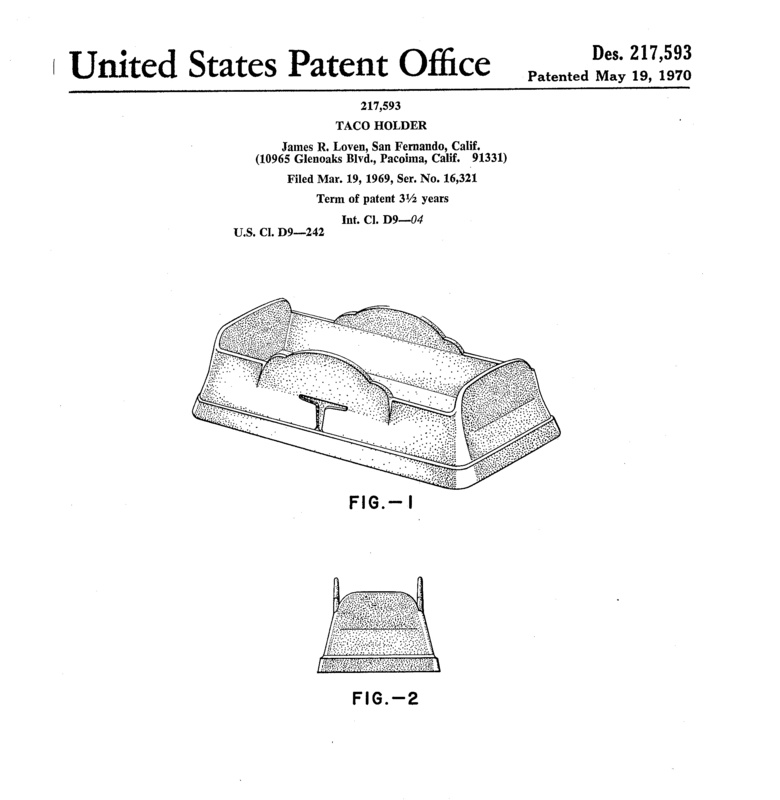 In 1984 inventor Howard J. Kotliar writes about his tray, “If the shell is folded to form a V-shape, which is a common type of sandwich becoming quite popular in this country, there is great difficulty in retaining all of the food within the partially eaten sandwich when it is placed on a plate or a tray, and the problem is worsened by the tendency of the sandwich to roll over on its side.” A lot of people were having this problem (not knowing how to eat a taco and a misconception of what a taco is). But this marketable idea of the taco and retainer barreled through American culture alongside the rise of supermarket Tex-Mex or “Hispanic” brands in the mid-20th century, and it shows no sign of abating. 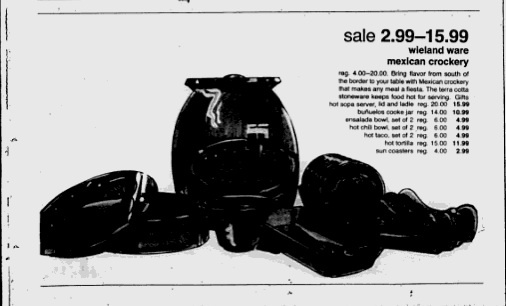 Take, for example, the terracotta Wieland Ware Hot Taco set, advertised in the March 14, 1984, The Courier newspaper of Prescott, Arizona, as costing $6.00 for a set of two, on sale at $4.99. Bentson-West designs offered a four-compartment holder made in Italy that promises to “make any meal a fiesta.” At each end of the accessory was a half-face with hair-like sunbeams that could’ve been Mesoamerican or Etruscan in origin. Myriad renditions, including those playing on cultural signifiers and stereotypes—chihuahuas, for example—flooded the market. The taco, once the province of street stalls, catering trucks, Mexican and Tex-Mex restaurants and fast-food franchises, was firmly wedged in the domestic sphere. Ad in The Courier newspaper of Prescott, Arizona,March 14, 1984. At the beginning of the 21st century, the taco garnered the attention of chefs with an upscale bent, among them: Jean-George Vongerichten at ABC Cocina in New York, Stephan Pyles at Stampede 66 in Dallas, Mexico City native chef-restaurateur Richard Sandoval at Maya in New York City, as well as John Franke at Velvet Taco. These chefs—and many others—have detached the proletarian food from its modest origins in order to exhibit in their venues, sometimes in a taco holder shaped in a zigzag form. When asked why they use a taco holder for plating, chefs explain how modern, attractive and different it is. But its function is also important. Velvet Taco’s taco holder, Facebook. Uncanny in its resemblance to the holder used at Velvet Taco is American Metalcraft’s brushed stainless steel model. It hit the market in 2012, a product of a fortuitous accident. As Lee Ann Kelly, the company’s vice president of sales says, “The American Metalcraft taco holder was actually created for another use. One of our chain customers asked us to develop the product to be used in the kitchen to make flatbread sandwiches. This was the use for a few years before we realized that it could be used for taco presentation.” Now the Illinois-based company counts Stephan Pyles among its wide range of customers including “fast food restaurants, hotels, caterers, the list goes on and on,” says Kelly. Evoking Juvencio Maldonado’s ingenuity is the Taco Rack, which works double duty as oven utensil and tabletop accessory. Elain De Luca Byrnes, chief marketing officer of LA Cook-a-Rack-a Ltd., maker of the Taco Rack, explains: “The Taco Rack is an invention of my business partner Nicolas Stanco. 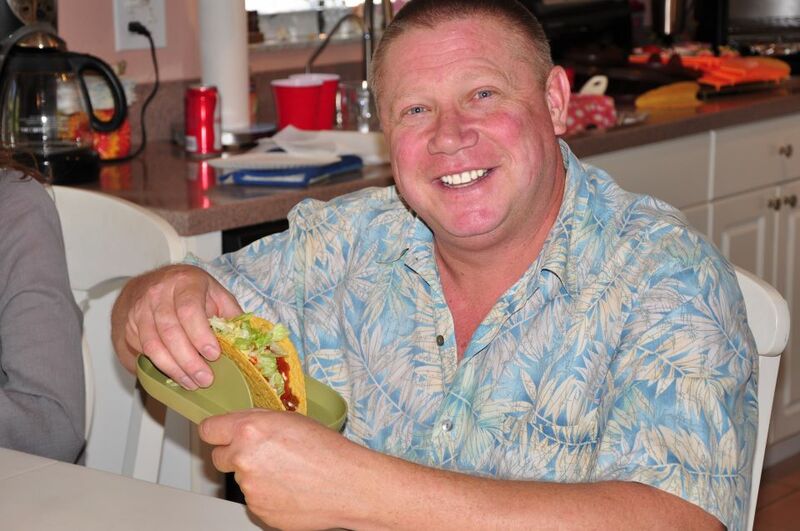 He designed it and had prototypes made to provide a better taco dinner experience for his family. The stress and mess of filling breaking taco shells was too tiresome for them. That led to having it patented and marketed to the home chef and commercial chef.” Among the company’s clients are Royal Caribbean Cruises, Dave & Buster’s, Whole Foods Markets and restaurants across four continents — including the Hawaii location of international Japanese BBQ chain Gyu-Kaku where they’re used to serve smoked pork belly tacos with yuzu pico de gallo and sake miso salsa. 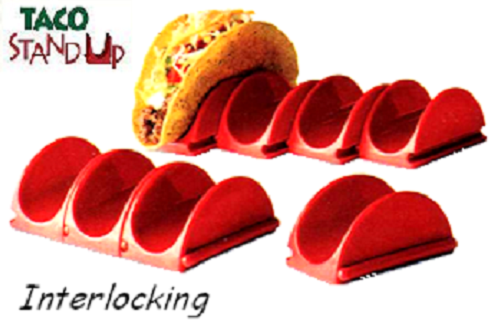 The Taco Rack is available as Chef Series Six Shooters, Triples, Mini Six Shooters, Mini Triples and as a solo holder. Clockwise from top left: Taco Rack, Prutt’s taco holder, Classic Tacos, Taco Truck taco holder. Distinguishing the Taco Rack from the scads of other models on the market, De Luca Byrnes points out a common drawback of the pervasive restaurant taco vessel. 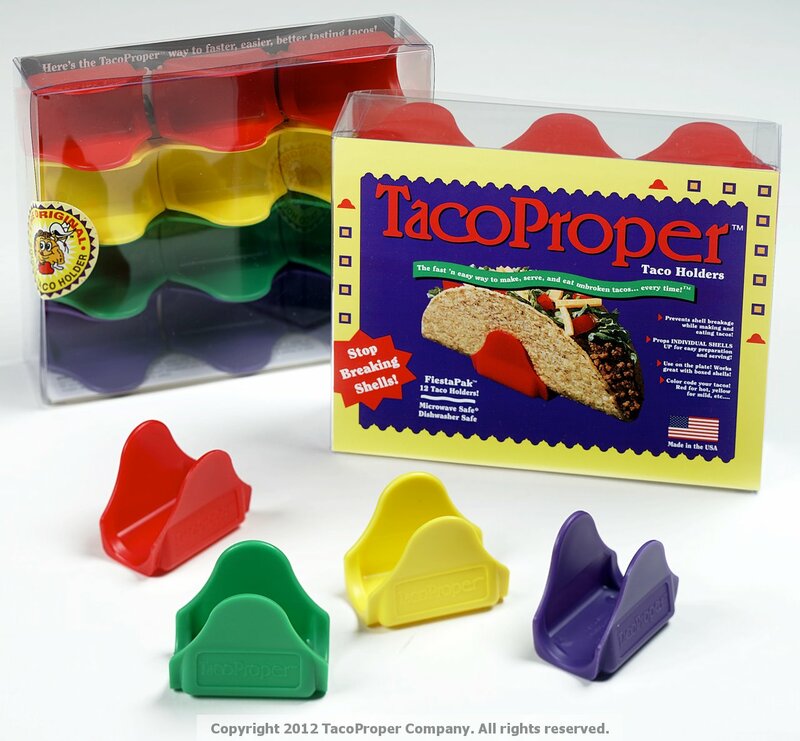 “American Metalcraft’s taco holder design does not provide enough space to pick a taco up. The fold of the metal is too tight… .” Indeed, failed attempts at picking up a taco from a holder inset can result in tiny fissures spreading toward the tortilla’s interior. Salsa can also stream from the bottom of the plucky parcel of sweet, cushiony pork with a charred coat under a loose quilt of pickled onion as iridescent in color as in flavor atop a tortilla that would be a marvel of dining presentation without employing a taco holder. The taco holder is ostensibly used to eliminate that scenario while being visually seductive. The cost of a restaurant branding itself as contemporaneous can be a messy experience for the diner. One reason could be the amount of filling tucked into the tortilla. As Sandoval notes, “One drawback may be limitations on the amount of ingredients that can be added to the tortilla.” If overstuffed, the filling could scatter onto the table and the diner. 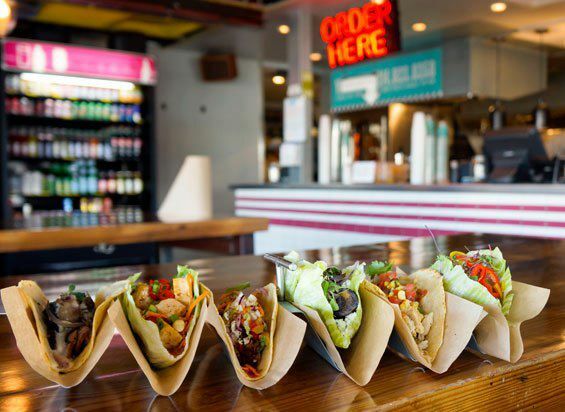 Nearly 1 million TacoStandUp holders have been sold. Nicholas T. Dominguez found inspiration for his TacoStandUp holders through his family. In the 1960s, he worked at his aunt and uncle’s Kansas City Mexican restaurant, Casa De Taco’s. There, the go-to orders, crunchy tacos with all the trimmings, were buoyed by aluminum foil and crossed fingers. Some 20 years later, Dominguez’s mother gave him Tupperware taco holders (not to be confused with Tupperware’s October 1991 limited-release taco holders currently available through tertiary outlets like eBay). “All tacos deserve uprightness,” the inventor thought. “I’d imagined a better holder and the interlocking design for several years, drew some pictures. One day in talking with my daughter about it, I realized I should go for it—so she’d know her Dad was more than talk!” The TacoStandup has since been sold through Avon’s catalog and is closing in on 1 million units purchased, according to Dominguez, who says he has received orders from Japan and Australia. Bahnsen with a Taco Susan taco holder. But, for Bahnsen, there’s more to his invention than containing what a plethora of Anglo Americans perceive as sloppy Mexican. “Taco Susan is more than keeping taco night tidy. The Taco Susan takes an ordinary meal, and makes it an event! Family Taco Night! 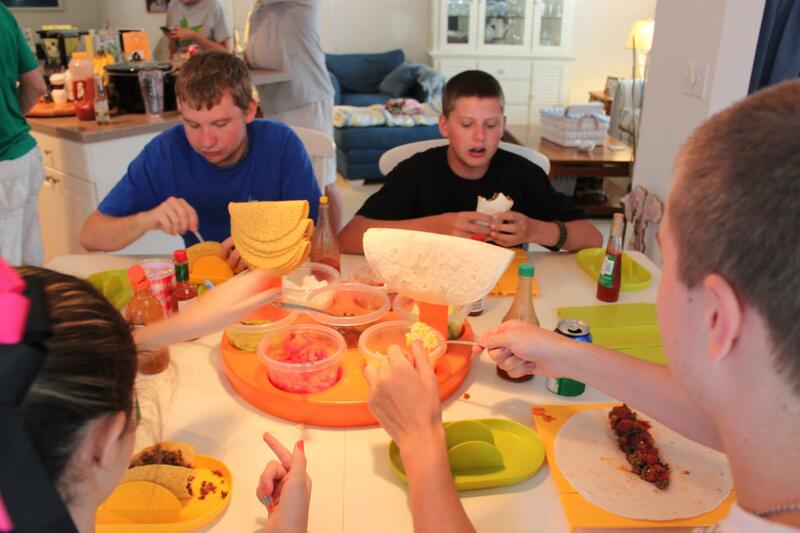 When you have the Taco Susan set up on the table, and the kids come home from school and see it, there is no mistake what is for dinner!” The Taco Susan transports the entire clan to an unthreatening dimension where fiery handheld pockets can be safely consumed. 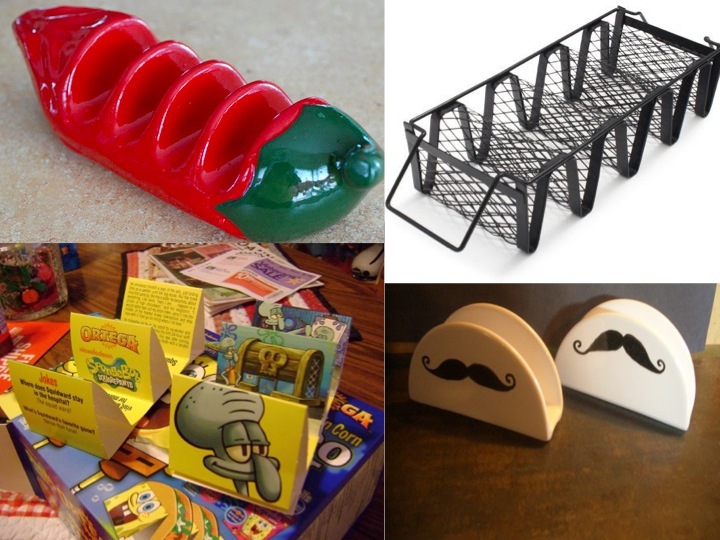 ChilePepper, Williams-Sonoma, Spong Bob Squarepants Licensed Taco Holders, Mexican Handlebar Mustache Taco Holder. 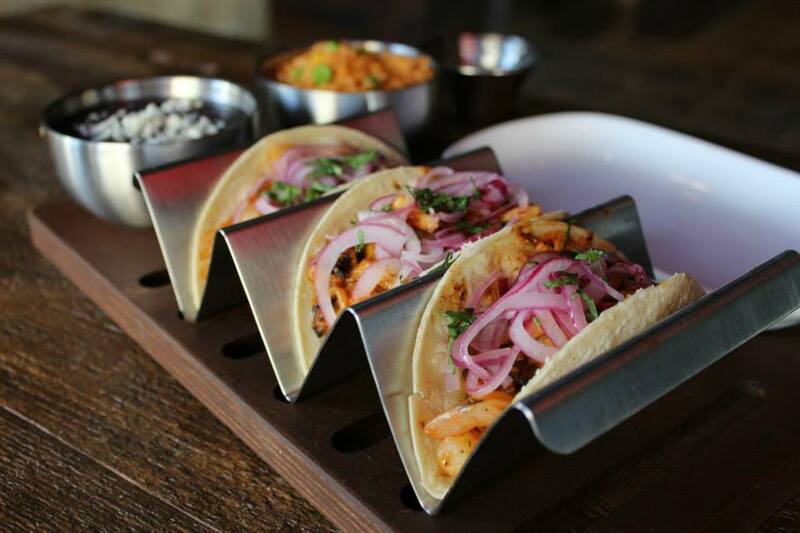 Whether the Taco Susan becomes the commercial hit Bahnsen hopes it will be, his invention has joined the bright and busy history of the taco holder that since Loven’s handiwork, has given consumers and businesses a plethora of options for those taco holders, trays and stands. The paraphernalia endure in stainless steel, plastic, ceramic with whimsical names. They are fashioned into the shape of a chile, a Chihuahua, a see-saw, monkey bars, a sombrero. Unique designs, like the handmade stoneware with lace pattern from arts and crafts marketplace Etsy.com, are also available. Hart Family Innovations created a holder that rests in a brief case, facilitates drainage and in its patent application cites Montezuma’s feast held in honor of Hernán Cortés and his conquistadores. Even high-end kitchen retailer Williams-Sonoma offers chic contraptions for table, oven or grill. These products provide diners not well-acquainted with traditional tacos a comfortable entry point for culinary tourism on taco night or date night. Some, like TacoProper, claim salvation with mottos such as “Sudden Relief For Taco Lovers.” Some are edible. They provide cachet and kitsch folded into one. And with the enduring popularity of the taco—from Taco John’s trademarking of Taco Tuesday and highfalutin renditions in four-star epicurean palaces to the latest gourmet taco truck and “unique concept” as well as Internet memes (e.g., “I Hate Tacos Said No Juan Ever”)—the taco holder’s use will continue. If for nothing else because it looks cool. Richardson M. Genuine Mexican and Spanish Cookery for American Homes, Putnam Printing Company, 1934. Arellano G. Taco USA: How Mexican Food Conquered America. Scribner, 2012. Pilcher, JM. Planet Taco: A Global History of Mexican Food. Oxford University Press, 2012. United States Patent Office, No. 2,506,305, Juvencio Maldonado, “Form for Frying Tortillas to Make Fried Tacos,” May 2, 1950. United States Patent Office, No. 2627222 A, Luna Santiago M. “Utensil for cooking tacos,” Feb 3, 1953. United States Patent Office, No. 2792774 A, Veach Joseph P., “Taco shell fryer,” May 21, 1957. United States Patent Office, No. D217593 S, James R. Loven, “Taco holder,” May 19, 1970. United States Patent Office, No. 4004501 A, Lois L. Guerrero, “Taco holding tray,” Jan 25, 1977. United States Patent Office, No. 5065870 A, O. Ray Conder Jr., “Taco holder,” Nov 19, 1991. United States Patent Office, No. 4573579, A, Brian K. Murdick, William H. Haase, International Paper Company, “Taco tray,” March 4, 1986. United States Patent Office, No. 4603825 A, Howard J. Kotliar, “Taco holder,” Aug 5, 1986. Massengill A. The Polished Woman: Hints, Tips, and Tricks to Getting Organized, Xlibris, 2010. United States Patent Office, No.7565864 B2, William L. Hart, “Food tray insert for holding tacos,” Jul 28, 2009. United States Patent Office, No. 20110256275 A1, John P. Gillig, “Edible taco style food shell,” Oct 20, 2011. Very nice work. Reminds me of a lot of scott@dallasfood.org‘s work. Still would prefer a chalupa to most hard shell tacos.